During a professional development session a while back I thought I killed someone. He didn’t respond when his name was called. He didn’t respond I tapped his shoulder. Finally, he responded when I shook him a bit harder. Lucky for me (and him) he was just asleep. But it was a wake up call to me and the way I approached delivering Professional Development. It also got me thinking about how much boring time educators spend in meetings and “PD” when they could be doing something more authentic. I'm going to bet we can all recall a meeting or boring PD we had to endure. Those meetings that drag on, and on, and on. Seemingly pointless meetings that, while they may have had a purpose when being planned that purpose got lost in the message and delivery. Many meetings are just information transfer. What are the dates for training for administering the next state exam? Who is going on the field trip? Remember to walk your kids to the cafeteria. 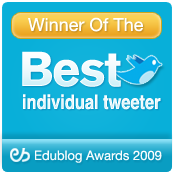 Think about Professional Development, specifically technology-related PD. Much time is spent on the how-to of technology. How to sign into the LMS. How to create a Google Doc. How to send a Tweet. 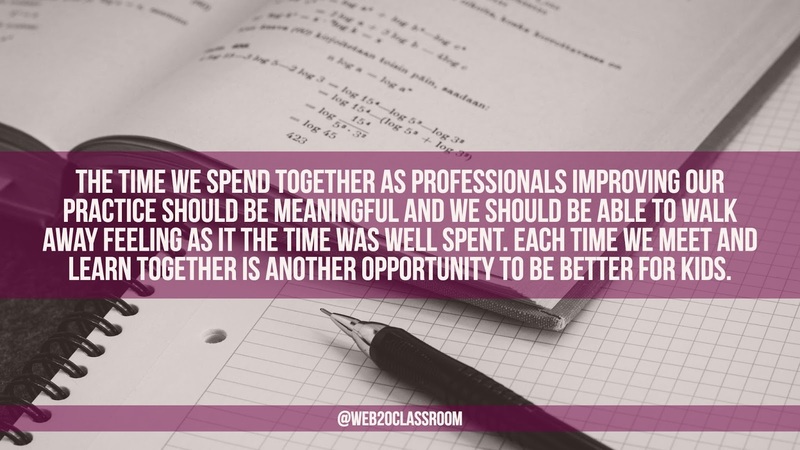 Much of the time in the actual PD is eaten up by tasks that can be learned outside the actual PD, freeing up the time when we do get together on more the why-to with technology PD or any type of professional development really. What if that hour/90 mins/half day was spent on meaningful, embedded professional development that was participant driven? We complain we don't have the time for that really good PD. Why? What if we adopted the model of the flipped classroom and applied it to meetings and Professional Development? Flipping PD and faculty meetings is essentially the same as flipping the classroom, but with adults. 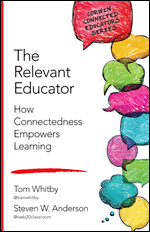 The idea is, there is some sort of information transfer (basic information about a learning concept) outside of the learning environment (classroom/meeting/PD) allowing for further discussion or extended learning when in the learning environment. The watered down version of flipping is that we front-load information about a concept outside of the classroom (meeting/PD) so when kids (adults) are in the classroom (meeting/PD) the time is spent on knowledge extension or deeper understanding of the content. I will admit it. I am not a big fan of flipping the classroom. I am, however, a huge fan of flipping faculty meetings and Professional Development. Now, I am by no means the first person to think about flipping PD or faculty meetings. Many have come before me and even my friend Peter DeWitt has a book dedicated to the subject. The notion has been around for a while yet it is still not yet caught on in many places. The time we spend together as professionals improving our practice should be meaningful and we should be able to walk away feeling as it the time was well spent. 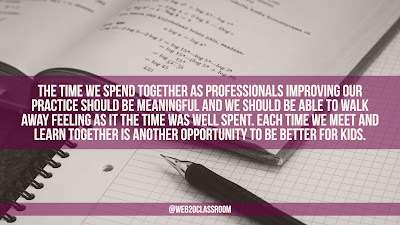 Meetings and Professional Development should provide opportunities to examine current pedagogical trends, learning, classroom embedded teaching techniques and technology and, above all else, the chance to talk with other educators and learn from each other. Each time we meet and learn together is another opportunity to be better for kids. It seems educators meet all the time. When I am working with teachers or administrators the consistent thing I hear is we meet too much with little or no end result. So instead of continuing meeting with no purpose, let's flip that time. Let's front load with all the basic information we all need, freeing up that faculty meeting or professional development time for more learning, PLCs, sharing, etc. The traditional notes in the mailbox and faculty memos are a great start. Distributed information ahead of time for review or study certainly frees up time when meetings or PD takes place. However, this is an area when technology can be of much benefit. There are many tools that can be used to share different types information ahead of time. You need to find something easy and something that won't take a whole lot of time, but will communicate what you need to. There is no rule for which works best. Try a few and see which is most effective and run with it. But don’t be afraid to gather feedback and refine your practice. What are some simple and easy to use tools you could flip those faculty meetings and professional development sessions...today? Videos-These are the traditional tool of the flipper. For many this will be a great option. There are some easy to use screencasting tools out there (Screencast-o-Matic being my favorite). Think about it like this. You can sit for 10-15 mins and record a mini presentation. Review the notes for the faculty meeting or demonstrate how to use the particular tool for the technology PD. Our attention spans aren’t much longer than that anyway. Participants can watch as many times as they need to get the information. And you don’t have to be Spielberg. Keep it loose and keep it natural. Have fun with it! 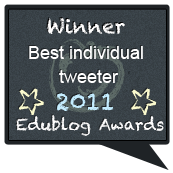 Blogs-A simple faculty or technology blog can transfer a great deal of information pretty simply. When I was an Instructional Technology Director many of my principals used blogs as a way to get the basic information out to staff each day. Who was going to be out of the building, reminders and links to important information. It becomes a running record of the day’s events and a great look-back for information. The same could work for a technology blog. Post all the how-to information or videos on the blog. Either way, you’ve freed up that time to spend on more meaningful conversations when you meet. Collaborative Docs-Tools like Google Docs could be used in the same way as blogs but more privately. Post all the necessary information ahead of time, but now we can add in a collaborative element. Using the commenting feature participants can share ideas, other resources or ask questions. The doc too can become a running record. Simply put the newest information at the top and push the previous information down the page. I’ve seen many faculty meetings flipped using something simple like Google Docs. Collaborative Learning Space-Perhaps your district or your school uses a Learning Management System like Canvas, Edmodo, Google Classroom or something else. No matter what you use, create a space for faculty or participants in a PD session. This was wildly popular in my district. We’d create spaces for PD sessions where we could communicate ahead of time with registered participants, get them started on the how-to, and they had a space to share with other participants in the class or course. The same was true for faculties. I had many principals using Edmodo with their faculties because they could post book study questions, presentations, and other information. Then the actual meeting time was spent on more meaningful conversation. Remember, the tool is the least of your worries. There are many more tools here I could list that could aid in flipping faculty meetings or professional development. The point isn’t the tool you pick. It’s what you do with the time you gain when you flip. Focus on using that time in faculty meetings to build culture or problem solve or dig deep into how to make the learning environment better. In professional development use the time gained to focus on the why. Why is this method better? Or how can it be applied to a specific discipline. Either way make the most of the time gained and you’ll reap the rewards.